Kade still wakes up in the night. He's a lot better than when we first moved into our house but Mickey and I find it annoying to be woken up in the middle of the night. I've told him repeatedly to just come in our room with his pillow and sleeping bag and sleep on the floor. He finally learned to do this without waking us up. (I was going to use that as a potd sometime but Mickey beat me to it today.) Last night he came in, I don't know when, and woke both of us. He had brought in his bedding to sleep on the floor but said something about bugs being in his sleeping bag and his bed so he wouldn't sleep there. When Mickey woke up this morning (he's up before anyone) he couldn't find Kade anywhere. Not in his room or the family room playing video games or watching a movie. After searching the entire house he finally found him in our room, sleeping in the recliner. 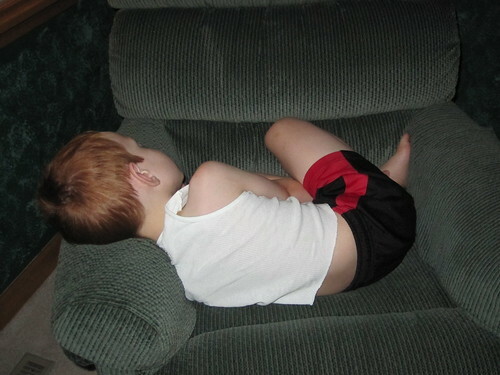 Through the foggy middle-of-the-night haze I was in I remember Kade climbing into the chair. I guess Mickey didn't see him. The chair is right by his side of the bed. I don't know how he missed him.